Join me on my Facebook page and post pictures of your homemade dog treats. :) Also, get updates on commercial dog treat recalls, ask me questions, and generally chat about how great our dogs are. Liver may not be your first choice, but I can guarantee that it is your dogs top contender for favorite dog treat. 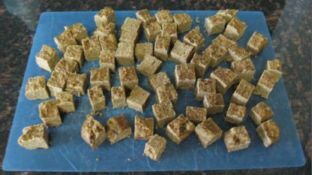 Make one or all of the following liver dog treats to see a whole new happy dance. 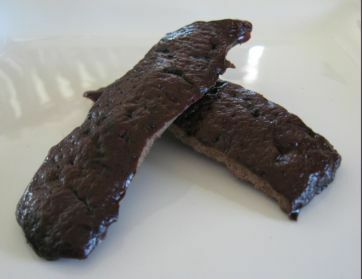 Easy Dehydrated Liver Treats can be made with calf liver or chicken livers. "As soon as I cut that pack of liver open my dog, Java, did not leave my side. This was the easiest ever to make. When they came out he was once again in the kitchen hoping for a taste. Well, Java LOVES them and so do I. This is one doggy treat we are sharing. LOL Seriously. And this will help with his training as he was getting tired of the other treats. Now he has something new and exciting. Can't wait to do other meat this way!" "Made the liver and carrot dog treats today, used gluten free flour instead of wheat as I'm gluten intolerant and that's what I had in the cupboard. My dog, Kes, was very interested in the whole process, think it was the smell of the liver, and she snaffled a bit of carrot as usual. Once in the oven she wandered off but as soon as they came out she was back and bouncing round the kitchen desperate for a taste. Her reaction on trying a cube was so funny, her tail was going round in circles, she had a grin on a her face and was begging for more. I think I can safely say I will be making more." Are you not sure what a Dog Happy Dance is? Check out this adorable video of a Golden Retriever doing a very happy, "Happy Dance". Life with our dogs is priceless. They give so much with asking very little in return. Take time out of your busy schedule to appreciate what your dog means to you. Celebrate the day by making homemade dog treats for your dog and your local animal shelter. "I have been making my 2 big dogs cookies and food for about 14 months. I have used many of your recipes which are all fantastic. Thank you. I have been looking for ways to make my cooking process quicker and was wondering if you could recommend a non commercial inexpensive machine to roll out the dough? Any guidance is appreciated." "Unfortunately I haven't been able to find a specific cookie dough machine, but I do have a couple alternatives for you to consider. The first would be a pasta maker. You can purchase one for $30, or less, attach it to your counter and roll out your dough. The only limitation would be that your dough would need to be smooth. In other words, you wouldn't be able to use carob chips, or other mix-ins, as these wouldn't roll out very well. The other option is a cookie press. These little gadgets would work great if your dough is on the thinner or softer side. You could easily press out little cookie shapes. You would probably need to adjust your baking time as these cookies will most likely be smaller than your usual roll and cut out dog cookies." 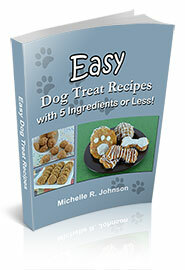 Are you still on the fence about my Easy Dog Treat Recipes eBook? "I'm making these again for the thousandth time.........this is the best recipe you have, as far as my dogs are concerned. :) Sometimes I add molasses to the recipe, like today. Just 2 T is about all I add. They love it. Thanks again for your website, we really love it!"